Do You Have The Right Below The Hook Lifting Device? 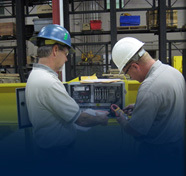 If your company or facility is like most, you spend countless hours comparing manufacturers of crane systems so that you choose the one that is best for your needs. You carefully consider costs, scope, scale, and reputation in the industry, as well as the ability of the crane manufacturer to design a system that is perfect for required lifting and moving needs. These are always important aspects of a lifting solution. However, there is one element that is often under evaluated: below the hook lifting devices. These may well be one of the most important elements of the system to consider. Any below the hook lifting device has to be compatible for the specific lifting needs. This includes the ability to lift specific load limits, as well as the ability to withstand particular work environments. This is determined by American Society of Mechanical Engineers (ASME) or by Occupational Safety and Health Administration (OSHA) standards. For example: Stainless steel below the hook lifting device are highly corrosion resistant, and can be a perfect option for clear rooms, food production, pharmaceutical uses, or in areas where there is a high risk of corrosion. These are often the devices used when corrosive chemicals are present, or when there is a need for a wash-down or sterilization process. Not all hook and lifting devices are the correct match for all loads. ASME actually specifies the proper shape-and-capacity fitting is used with each load. The best crane providers will always use ASME and OSHA standards, eliminating any need for the company to evaluate the use of the specific device. It is important to always maintain and inspect lifting devices. Checking for any signs of wear, stress, or fatigue in the metal will be critical for ongoing safe operation.